From Left; R. Sukhram, S. Deosarran, P. Peersaud, B. Harry, Mr Harry Mattai, B. Hackett for P. Prashad, and M.Bhagwandin after the presentation. Managing Director Harry Mattai of N&S Mattai and his family were over an hour early for the inaugural N&S Mattai sponsored tournament at the Lusignan golf Club last Sunday. At the end of the competition he declared that his eagerness was rewarded. The performances of the golfers were spectacular, and Mr Mattai is very likely to soon become another keen golfer at the Lusignan Golf Club. 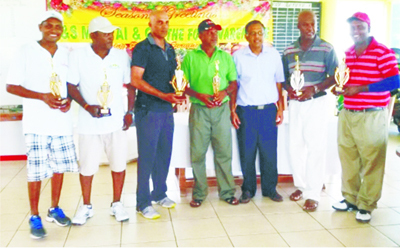 This second successive day of golf for the LGC was a wonderful experience for players eyeing up the two-day Guyana Open, which usually attracts players from Canada, the USA, Europe, the Caribbean and South America, billed for November this year. While the grounds were in fine condition, the intense heat of that sunny day saw a few players not being able to complete. On the other hand, others had good fun as they played. Sookram Deosarran, who had missed the previous day’s tournament, was on hand to cart away the first prize in the 0 -9 Flight, while 2nd place went to Saturdays winner Patrick Prashad. In fact, 4 of Sunday’s winners had been winners in Saturday’s play as well. The other new winner on Sunday was B. Harry who edged out previous day’s Ian Gouveia for 2nd place in the 10 – 19 Flight, won again by Rishi Sukhram. Pur Persaud, 1st in the 19 – 28 Flight on Saturday had commented that he hoped to win on Sunday too, and he ended in the top draw. Only he brought 2nd to Mahendra Bhagwandin who on Saturday had brought 2nd to Persaud. Like the Guyana Open to come in November, Saturday’s and Sunday’s tournaments were based on the Flight categorization in the medal play system. In the medal play system, the golfer with the lowest net score wins the prize. In the Flight categorization, golfers are placed in Flight categories depending on their handicap. Usually there are three Flights: 1st Flight 0 – 9 handicappers, 2nd Flight, 10 – 18 handicappers, and 3rd Flight, 19 – 28 handicappers. (A handicap is the number of points the player gets as an advantage, and is subtracted from the player’s gross total to determine his net score.) Sometimes a 4th Flight, specifically a Ladies Flight, is also played. Winners and their handicap and net scores were First Flight, 1st place – S. Deosarran 6 / 67, 2nd place – P. Prashad 8 / 70; Second Flight , 1st place – R. Sukhram 10 / 68, 2nd place B. Harry 15 / 73; Third Flight, 1st place M. Bhagwandin 28 / 70, 2nd place P. Persaud 28 / 71. Combining the scores of the 7 winners who played both days provides an interesting forecast for the Guyana Open. If their performances improve by November, each of them can expect to place on that big day. Net results of the 7 winners were; R. Sukhram 68, M Bhagwandin 69, P. Persaud 69, P. Prashad 72, I. Gouveia 73, A. Kishore 73, and B. Harry 78. Mr Harry Mattai on congratulating the winners, thanked the LGC for the opportuinity to invest in the sport. It was his first visit to the golf club, but he was very impressed and pleased with the cordial atmosphere among the golfers as well as their good performances. “My first day at the golf course has been a pleasant one. I walked the course for some time, became acquainted with some of the play and the players, and am happy to be part of this day for the Lusignan Golf Club. I will certainly continue to support this great sport in Guyana,” he said. He lamented the sorry state of the access road to the golf course and hoped that the relevant authorities would do something urgently to improve its condition. Club President, David Mohamad and Sectretary-Treasurer (Pandit) Rabindranath Persaud expressed how very appreciative LGC was for the sponsorship of N&S Mattai.